All the time, I see organizational change practitioners ‘accidentally’ leaving out the messy parts from their status report and exaggerating the good parts a little more. In this article I want to show why this is a bad idea, by means of a back-of-an-envelope calculation. 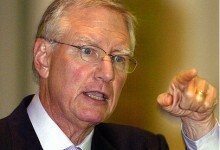 One of my favorite Tom Peters quotes is ‘Implementation is the last 99%’; and this is where the math starts for me. When an organization did the hard work of strategy and delivered a plan showing the way, the next big thing is to put on the boots and walk it. So if we were to walk the remaining 99% in terms of communication, what would the road be paved like? On some occasions I am requested by the project manager to send out a positive communication in order to preserve the overall belief of the organization in the project. If you spend too much time in the project cocoon you may be tempted to follow that request blindly. What’s more, if you open up any toolbox or methodology on change management you will find an abundance of propaganda tools (by the way, there is an excellent Wikipedia entry on that). So it’s no wonder that most (junior) practitioners fall into that trap. Here is another proposal on how we should be dividing the remaining 99%. The logic I follow is one of sustainability of business results. Therefore we need to focus on what we leave behind at the end of a project. The thing that teaches people how to fish so they can eat forever. People need a platform that helps them to connect and share their knowledge. This is called the social architecture. As organizational change practitioners, this is our main deliverable. Instead of being right with our propaganda toolkit, we should focus on being in relationship. In the end, implementation is a relationship thing. Stick to the 1% strategy. This is the driver and the enabler of the change. Spend 49% of your effort on listening (you know: the forgotten skill…). This means that you have to go local and sit through the long (and often very technical) discussions of problem solving. Be there when they share war stories and tinker with a solution until it fits. Spend another 49% of your effort on a humble attitude. That’s really tough, because most of the time you will be the dummy in the group. You are no longer the expert once you are on the shop floor. Get over it and get down to it. By the way, this scares the hell out of testosterone-driven project managers. Then – and only then – will you be ready to spend the last 1% on broadcasting. In this case your message will no longer be propaganda, but rather an acknowledgement of what people have shared. And yes, you are allowed to make sense and be positive in that broadcasting moment, because you know what? If you really, truly listened to the people – no matter their level of resistance – they will have pointed out the bright spots and elegant solutions that you would not have been able of imagining yourself. 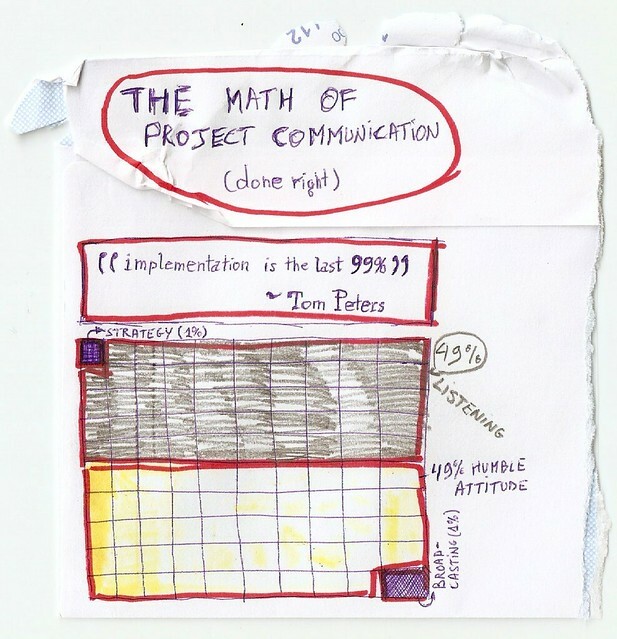 The only question is: do you have the guts to do the right math of project communication?